Queen duvet cover (88" x 88") featuring the image "Merry-go-round At The Prater" by Madeline Ellis. Our soft microfiber duvet covers are hand sewn and include a hidden zipper for easy washing and assembly. Your selected image is printed on the top surface with a soft white surface underneath. All duvet covers are machine washable with cold water and a mild detergent. Len, I am delighted you think so. Thanks for the v/f as well. If I was rich I would own one of these ... maybe two of them. Nice!!! Johny, thanks for the nice comment. Thanks for featuring this in your group Didi. So sweet! 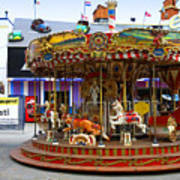 Please enter this in the new group "Carousels and Carnivals". DIDI, I am honored to enter your new group. Thanks! Madeleine, thanks so much. I am only sorry I am responding so late. 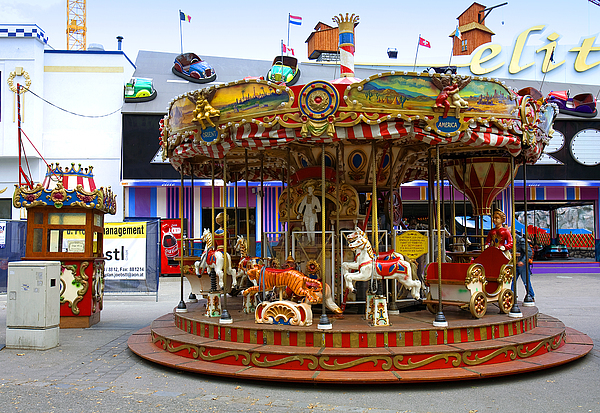 This is the merry-go-round at the Prater in Vienna, Austria. 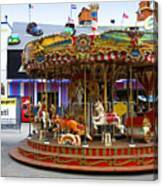 The Prater amusement park is a landmark in Vienna.